As we head toward another Advent season it is inevitable that the Incarnation is going to get some airtime in our churches. Perhaps you will hear sermons on the classic Christmas passages in Matthew 1-2 or Luke 1-2. Maybe you will hear sermons on John’s prologue, or Isaiah’s Immanuel prophecy, or Galatians 4:4. Hearing about Christmas in the build up to Christmas is not exactly a surprise, but isn’t the Incarnation for life, not just for Christmas? For instance, think about how important the Incarnation is to your Christian faith. Most will agree that Jesus was born in order to die, that Easter is the reason for the season and other pithy little seasonal quotables. For some, that may be pretty much the full extent of its impact. In order to live a perfect life and die in our place, the Son of God had to first become one of us – hence the Incarnation. As we often say in Cor Deo, if that were the whole truth then it would be reason enough to praise God for all eternity. But it is not the whole story. The Son of God did not become one of us merely to perform the rescue work at Calvary. There is much more to it than that. 1. Revelation. When Jesus became one of us at Bethlehem (or technically, at conception), his was a mission not only of rescue, but also of revelation. He came to show us the Father. That does not mean simply that Jesus’ morality revealed God’s standards, nor even that Jesus’ character reflected the Father’s values, but that in the Incarnation we get to see what kind of God God is. He is the kind of God who is humble, who is self-giving, who is sacrificially loving, who is inclined towards those he loves, who will do whatever it takes to pursue and woo hearts bent away from him in abject rebellion. Our God is an Incarnating kind of God, a God who moves towards us when we don’t deserve it, and a God who dives into our mess to lift us out. Yes, Jesus was on a rescue mission, but it was first of all a revelation mission. 2. Identification. When Jesus became one of us at Bethlehem, he did not have tunnel vision for Calvary. Yes that was the intended destination, but he did not simply come and bide his time until that mission became possible. He truly became one of us. He loved, he cared, he laughed, he cried. We are told in Hebrews 4 that he was tested in every way just as we are, yet without sin. Remember that temptation only needs to rise to the level of our compromise, but since he never did, it must have risen to full force. Yet without sin. He is more than able to sympathise with our weaknesses because he did not choose to hide in a castle until his Calvary mission, he came right into the heart of human life and human pain. He truly became one of us, identifying to the full, so that now we have a high priest who can fully sympathise and represent us forever before the heavenly throne. 3. Union. When Jesus became one of us at Bethlehem, he was not on a thirty-three year excursion into humanity. He did not pop into our world only to shift into celestial reverse and head back out to the throne leaving his humanity behind. Jesus is fully God, fully man, fully one, forever. The Incarnation was not temporary. This means that he can continue to reveal the Father to us in a unique way forever. This means that he can continue to represent us to the Father in a unique way forever. And this means that his rescue mission was not to bring us to a better place, end of story. It was to bring us much deeper into the wonder of God’s love than that – he became one of us so that he could become one with us. The great union of the Trinity has moved deliberately into humanity through the great union of divinity and humankind in the person of Jesus. And that great union of the Incarnation was a necessary step not only to forgive us for our sin, but to make possible our union with Christ that will be our forever delight. There is more to add, but let’s at least start there. God the Son became human so that we can know God in a way we never could before, so that we can be represented before the Father better than we could have ever imagined possible, and so that we can be brought right into the very heart of the Trinitarian relationship through marriage. For God the Son the Incarnation was not just for Christmas, nor even just for thirty-three years and a rescue mission, it was forever, and it was for us. As we head towards another Christmas let’s be sure to ponder the wonder not just of that first Christmas, but the daily wonder of a God who moved toward us in such a stunning way. 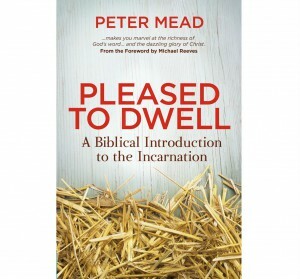 Peter Mead’s Pleased to Dwell: A Biblical Introduction to the Incarnation is a great read in the build-up to Christmas. 24 short and gripping chapters make for a great devotional read during the days of Advent. Now is the time to order a copy so you have it in time for 1st of December. If you have read it before, please share any positive reviews to encourage others to read it this Advent! 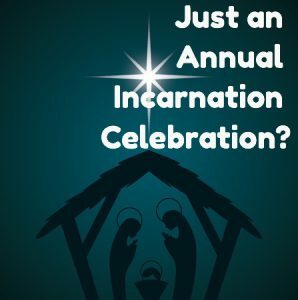 One Response to Just an Annual Incarnation Celebration? The 3 paths that you’ve flagged up are immensely helpful …and pregnant with possibilities for Christmas talks. I’ve got the book and look forward to Peter’s fleshing out of these amazing themes with The Word. Hungry with anticipation.